US: Eagle Materials has reported its financial results for the third quarter of the 2018 fiscal year, which ended on 31 December 2017. It recorded record revenues of US$359.4m, a rise of 19% compared to the same period of the 2017 fiscal year. Gypsum wallboard and paperboard revenues for the third quarter of the 2018 fiscal year totalled US$162.6m, which were 11% greater than the same quarter a year ago. The average gypsum wallboard net sales price this quarter was US$151.13/MSF, 1% less than the same quarter a year ago. Gypsum wallboard sales volumes were a third quarter record of 709MMSF, a 10% increase from the same quarter last year. Paperboard sales volumes for the quarter were also a record and 7% greater than the same quarter a year ago. The average paperboard net sales price for the quarter was US$581.95/t, 11% greater than the same quarter a year ago. Gypsum wallboard and paperboard activities reported third quarter operating earnings of US$50.7m, up by 1% from the same quarter last year. The earnings improvement primarily reflects improved gypsum wallboard and paperboard sales volumes and higher average paperboard net sales prices. During the third quarter, Eagle and its subsidiary, American Gypsum, entered into settlement agreements with counsel representing the direct and indirect purchaser classes to settle all claims made against the company and American Gypsum. Pursuant to the settlement agreements, which remain subject to court approval, the Company and American agreed to make payments totalling approximately US$39m. Eagle and American Gypsum continue to deny all wrongdoing but settled to avoid further litigation expense, distraction of management, and the risk of litigation. Eagle expects to make this cash payment in the next 12 months. US: Gypsum Management & Supply, Inc. (GMS), a distributor of gypsum wallboard, suspended ceiling systems and interior construction products, has acquired ASI Building Products, LLC, a provider of ceilings and building products. Both the companies are based in the US. Following the transaction, ASI Building Products majority owner and industry veteran Dave Mayer, along with the entire ASI team, will continue on with GMS going forward. The acquisition will allow GMS to expand its presence in Michigan, with a portfolio of quality products and reinforces its commitment to customer service. US: Eagle Materials' revenue has risen by 23% year-on-year to US$366.1m in the first quarter of its 2018 fiscal year, which runs 1 April – 30 June 2017. Its first quarter earnings before interest and income taxes increased by 22%, reflecting improved sales volumes and net sales prices across nearly all businesses. Eagle Materials' Gypsum Wallboard and Paperboard revenues for the first quarter totalled US$154m, 9% higher year-on-year. The average gypsum wallboard net sales price in the quarter rose by 10% to US$1711/Mm2 (US$159/MSF). Gypsum wallboard sales volumes rose by 11% to 60Mm2 (654MMSF). Paperboard sales volumes fell by 5% to 79,000t, reflecting the timing of third-party purchases. The average paperboard net sales price rose by 10% to US$550/t. Gypsum wallboard and paperboard reported first quarter operating earnings fell by 4% to US$48.8m. The earnings decline primarily reflected increased operating costs at Eagle Materials' paper mill due to the timing of its annual maintenance outage and higher recycled fibre costs, partially offset by improved wallboard sales volumes and sales prices. US: USG Corporation has reported its financial results for the second quarter of 2017, showing a double digit increase in wallboard sales despite a competitive environment. "Our US wallboard shipments in the second quarter of 2017 were up double-digits and were at the highest levels we have seen since 2008," said Jennifer F Scanlon, President and CEO. "However, rising commodity costs and a competitive pricing environment weighed on our operating margins and second quarter performance. We are taking actions to address inflation and will continue our strategic investment in advanced manufacturing to deliver profitable growth." On a consolidated basis in the second quarter of 2017, USG's net sales were US$811m, compared to US$769m in the second quarter of 2016. Operating profit decreased to US$96m from US$122m, while adjusted operating profit decreased to US$117m from US$127m in the second quarter of 2017 compared to the second quarter of 2016. USG generated US$36m compared to US$74m in the second quarter of 2016. The corporation's gypsum segment generated US$90m of operating profit in the second quarter of 2017. On an adjusted basis, operating profit of US$95m in the gypsum segment decreased by US$6m compared to the second quarter of 2016. US wallboard volumes increased by 10% in the second quarter of 2017. US wallboard prices decreased by approximately 1% due primarily to competitive pricing pressures and the impact of transitioning certain wallboard volumes from wholly-owned distribution at L&W Supply, which was sold in 2016, to independent distribution. USG's US wallboard production costs increased by US$8m due almost exclusively to rising waste paper costs. Shingler said, "Combining forces with GMS is the right next step in our growth trajectory. GMS shares our passion for customer service and our commitment to providing high-quality products. We have successfully expanded our business to become a leading specialty distributor in Pompano, Miami and West Palm Beach, Florida. We are excited to further improve our ability to serve new and existing customers with the strong support of GMS' national scale, operational expertise, and strong financial position. Being a part of the GMS family is the perfect fit for us." Chris Doyle, Vice President of the Southeastern division of GMS, added. "We are very happy to welcome the Olympia team to our company. Olympia is an excellent strategic fit for GMS with its broad product offering and loyal customer base in attractive markets. The acquisition of these three established locations in South Florida provides a very complementary addition to our strong existing positons in Central and Northern Florida. Furthermore, the highly seasoned team is driven by success. We look forward to integrating these assets onto our platform and remain vigilant in our pursuit to further strengthen GMS' leadership positions in the Southeast and nationally for years to come." GMS Inc has also acquired Steven Kempf Building Material Company (SKBM) headquartered in King of Prussia, Pennsylvania. SKBM is a supplier of drywall, ceilings, steel studs and related construction products in the greater Philadelphia metro area and was founded in 1994. SKBM services large and small projects in the commercial and multi-family residential end markets. With a 132,000 sq ft state-of-the-art facility, it has an operating history of two decades and its entire team will join the company, including its founder and president Steven F. Kempf. GMS operates a national network of distribution centers across the United States. GMS' extensive product offering of wallboard, suspended ceilings systems, or ceilings, and complementary interior construction products is designed to provide a comprehensive one-stop-shop for our core customer, the interior contractor who installs these products in commercial and residential buildings. US: The Gypsum Association has been designated a Preferred Provider under the International Code Council (ICC) Preferred Provider Program (PPP). The Gypsum Association already is an American Institute of Architects (AIA) Continuing Education System (CES) Provider. The ICC PPP provides building code officials and others with education related to codes, standards, and guidelines, as well as building construction materials, products and methods. 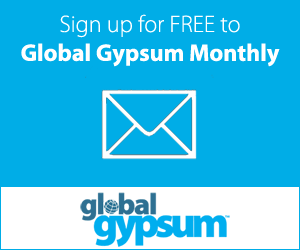 The Gypsum Association intends to provide online education for its GA-600 Fire Resistance Design Manual, a publication offering fire resistive designs referenced by model building codes. China: The Ministry of Justice has returned a lawsuit in which thousands of US homeowners say a 'cabinet-level' agency should pay for damage to their homes from alleged defective wallboard made in China. The ministry says it won't serve the legal papers because the agency is immune to such lawsuits and the legal service would infringe upon China's sovereignty. US District Judge Eldon Fallon has ruled that Taishan Gypsum Company must pay for damages from the wallboard it made. The judge is considering damages for up to 4000 homeowners in six states. The brief letter from Beijing became part of the court record this week, about 21 months after lawyers for the homeowners sued the state-owned Assets Supervision and Administration Commission, which oversees 117 state-owned companies. It was dated 8 April 2016. Fallon ruled in 2010 that Taishan's wallboard emitted sulphur gas that damaged the homes of seven 'bellwether' plaintiffs from Virginia, making occupants ill, corroding copper, silver and other metals, damaging appliances and electronics, and stinking up the houses so they were "hard if not impossible to live in." The other states involved in the lawsuit include Alabama, Florida, Louisiana, Mississippi and Texas, according to Associated Press. US: Transnational Group has delayed the start of gypsum mining and production at its property in Sandy Valley, Nevada. It blamed the setback on unforeseen delays by the Bureau of Land Management (BLM) in issuing Transnational's exploration permits due to the agency's lack of resources. It anticipates that it will will be able to obtain the necessary permits to commence exploration at the site within sixty to ninety days, barring any additional requests or delays by the BLM. "Due to delays imposed by the BLM stemming from its lack of qualified geologists in our area that could not be foreseen by management, the timeline of our Sandy Valley Project has been extended. However, we expect to secure an exploration permit in the near future and anticipate that Transnational will continue its progress towards producing gypsum on this property," stated Transnational Group's CEO, Philip Dutoit. US: Headwaters Resources has announced it has entered into a definitive agreement to purchase 100% of the membership interests of Synthetic Materials based in Louisville, Kentucky. The acquisition, which is subject to the satisfaction of certain closing conditions, is expected to close in Headwaters current fiscal year. It is intended to complement the coal combustion product management operations of Headwaters. Synthetic Materials handles synthetic gypsum processing and management. It has 21 years of experience providing services to the flue gas desulfurisation industry, including the design and construction of gypsum dewatering systems, gypsum marketing, landfill and pond management. At present it provides operations and maintenance services at 10 different utility sites and manages over 4Mt/yr of bulk synthetic gypsum, generating approximately US$25m in annual revenue. The expected purchase price will range between US$38 – 45m, depending upon certain conditions.